I am so often faced with a bag of produce waiting to be used in my fridge. Something I thought I wanted when I was in the store and then the days start to pass, my tastes change and there it sits. I guess that happens when you are an unorganized shopper and shop without a list or recipes. I finally gave up on my spinach salad and decided on this recipe. It was super easy and would be a great side to anything...steak, chicken, fish, etc. In a very large pot or Dutch oven, heat the olive oil and saute the garlic over medium heat for about 1 minute, but not until it's browned. 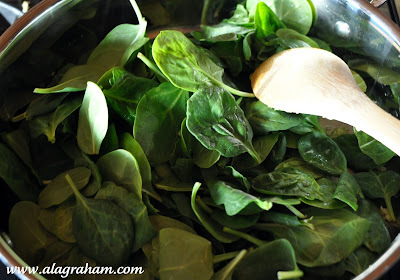 Add all the spinach, the salt, and pepper to the pot, toss it with the garlic and oil. Cover the pot, and cook it for 2 minutes. Uncover the pot, turn the heat on high, and cook the spinach for another minute, stirring with a wooden spoon, until all the spinach is wilted. Using a slotted spoon, lift the spinach to a serving bowl and top with the butter, a squeeze of lemon, and a sprinkling of sea or kosher salt. Serve hot. I make this all the time, and we love it. Weird how much goes into the pan, and how it wilts down to almost nothing! So glad you shared this. 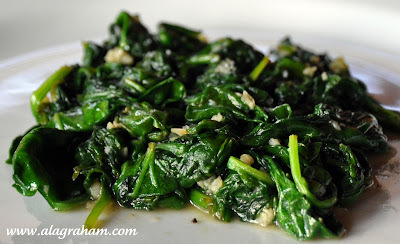 I make so often this recipe, I like becouse is esay and fast........Love spinach!! This sounds like it should be a regular. Elena, sometimes those are the best recipes! Debby, I know! 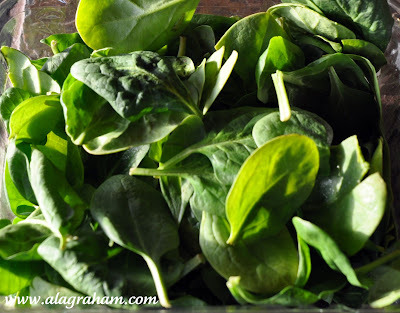 The 1st time I made it I kept rechecking the recipe thinking the amount was a typo because it seemed like a HUGE amount of raw spinach but then before you know it, it wilts down to a tiny amount. Zia, It is so easy and fast...the perfect side. Kim, I always add spinach to eggs too. 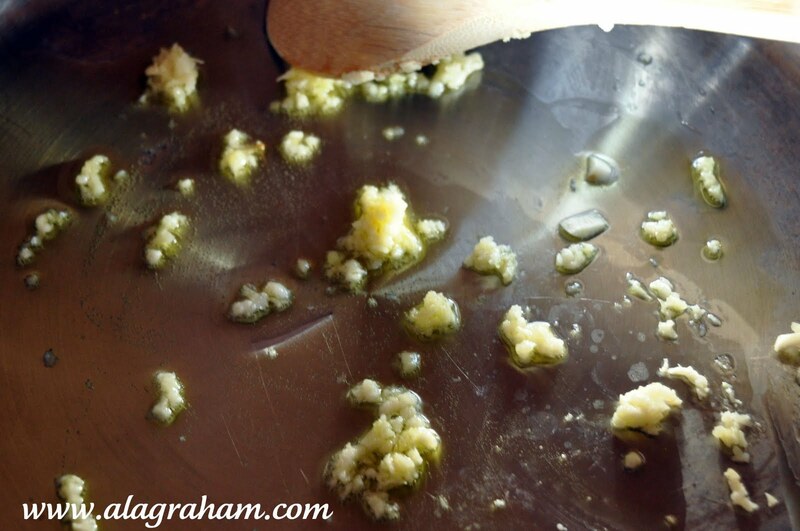 This is also great in soups and pastas...pretty much anything. We have similar shopping styles!!! Just love spinich - your (excellent) photo at the top is making me really hungry!